When we lose someone we often default to standard superlatives or platitudes, too hurt to muster anything more. But that won’t do for our now-absent friend. Cause was unique in just about every way we can think of. He was a valued mentor, friend, leader, and doer of difficult things. Many of us knew him and his family well. To shield many of us from our deep sorrow at Cause’s passing and for those who did not have the pleasure of knowing Cause and his family, we offer the following thoughts and recollections of our departed friend. You could say Cause was a “Renaissance Man,” although he might take exception to such a fancy descriptor. Imagined objections aside, he was a star varsity football player when at Newbury Park High School, a curious student as an undergraduate on the beaches of UC San Diego, a dedicated educator who first took the path towards education with his Masters of Education before turning to invasive species research in the Hawaiian islands during his PhD at UC Berkeley, and committed family man who was drawn back home to Ventura County rather than pursue positions with more prestigious or established institutions. 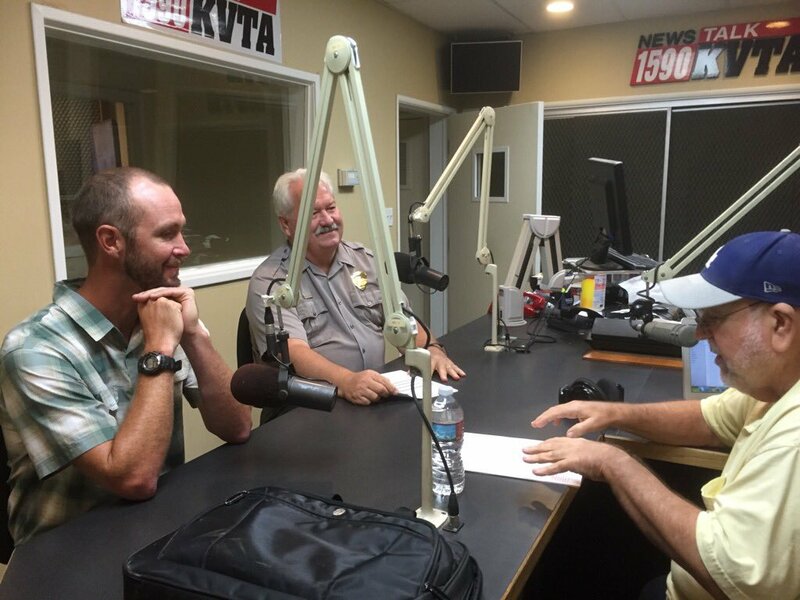 Cause being interviewed at Ventura radio station KVTA with Channel Islands National Park Superintendent Russell Galipeau. Building something as special and complex as a university in the 21st from scratch is no small feat. Those of us who came in the very early years of our campus were often overwhelmed by the sheer number of tasks needing to be done, diversity of courses to craft, amount of infrastructure needing overhaul, and all manner of policy and procedural structures built. As our campus grew and matured there has remained a huge need for innovation, creativity, and vision. But as we have entered our institutional adolescence, we slowly left that “start-up” mentality. To be sure we still have a tremendous amount of work to build our campus. But it is not the same. Or at least it was generally not the same. A glaring exception to the growing “normality” of our university was the creation of our satellite facility on Santa Rosa Island. Assembling a new type of field station required an unusual person. It required a leader with the type of mindset of those first faculty a decade earlier. And Cause struck me as exactly that kind of guy when I first met him in the office of my colleague Dr. Don Rodriguez in the fall of 2012. Cause had come in to chat about possible lecturer positions in our ESRM program. But as soon as he had left, Don and I immediately started chatting about how impressed we both were with his skill sets and interests. Within five minutes we were already saying that he could be a perfect candidate to shepherd our nascent station from the drawing board to opening. Dr. Dan Wakelee had put years into creating the space administratively, politically, and institutionally for our station, and we were then in need of that perfect day-to-day person to literally birth the station. In Cause we were to find someone that exceeded every one of our expectations. In true joint partnership fashion, the hiring committee for our founding station manager was comprised of both CSUCI and Channel Islands National Park personnel. Whomever we hired had to be able to mesh with both the worlds of academia and the Park Service. Suffice it to say Cause nailed that interview. He sealed the deal during an on-island visit when some of the interviewers giving him a facility tour pulled up a couple of floorboards to reveal challenging infrastructure in need of repair. Most folks would have gazed down into the open hole and made some comments about possible options for repairs. Not Cause. He jumped down into the hole immediately and started poking around. Cause was not one to sit on the sidelines or comment from afar when he could be in the thick of it. He was always all in. By 2013, Cause was ensconced in his new position as our first-ever Santa Rosa Island Station Manager, a title which has never come close to all that he did for our community. First and foremost Cause presided over the renovation and formal opening of the station, converting the former bunkhouse into an accommodation and dining facility. Renovating our soon-to-be-livable Directors House was next on the list, followed by the addition of a field laboratory trailer, expanded sleeping capacity via tent cabins, etc. This work would bring not only Cause, but his entire family to the island for weeks-long (or longer) stints. We were blessed that the entire Hanna clan were at a stage in their lives where they could do so. Having a giggling toddler running around was a tangible expression of how committed we were and are to creating a space with a true sense of belonging and inclusion. If all that Cause brought us was a fantastic ability to organize and renovate and administer, we would have been in fantastic shape. But he clearly brought so much more. He brought a strong vision of what our Research Station could be. And this was not one of a subordinate, satellite facility serving a few academic programs. Rather Cause envisioned a facility that was central to every aspect of our CSUCI mission. The station would be a place that directly fostered interdisciplinarity, multicultural engagement, service learning, and international perspectives. Such a vision needed additional resources. So he went out and found them. Nevermind that staff typically don’t author, serve as Co-PIs (or even lead PIs), or run externally funded research efforts. Cause did. And while those research projects are addressing key unknowns about our natural world and how we engage young people with that world, the main motivation from Cause’s perspective was to have additional arrows in his quiver to share the Santa Rosa Island experience with more and more folks. Especially students (from middle school to university) who had never stepped upon a Channel Island before or who had never considered places like Santa Rosa within their worldview or career options. Cause set the tone for every student group to the islands. He was not satisfied giving a safety introduction or telling them about a few plants. He saw everything as an opportunity to engage with the entire stew that is both our natural and human history. If you were new to the island he made sure you heard about everything from the Chumash’s long history on the islands, to old ranching activities, to the geomorphology of the east end, to the ecology of our sandy beach, to management success of invasive species eradication, and to the importance of a sense of place and ability to disconnect from our frenzied and wired world on the mainland. And this was all done with a wry smile and boundless energy and enthusiasm. Now, every instructor bringing over a class to the island expects an orientation of such depth and diversity. It matters not if it is a group of Business, Art, Sociology, or Anthropology students. 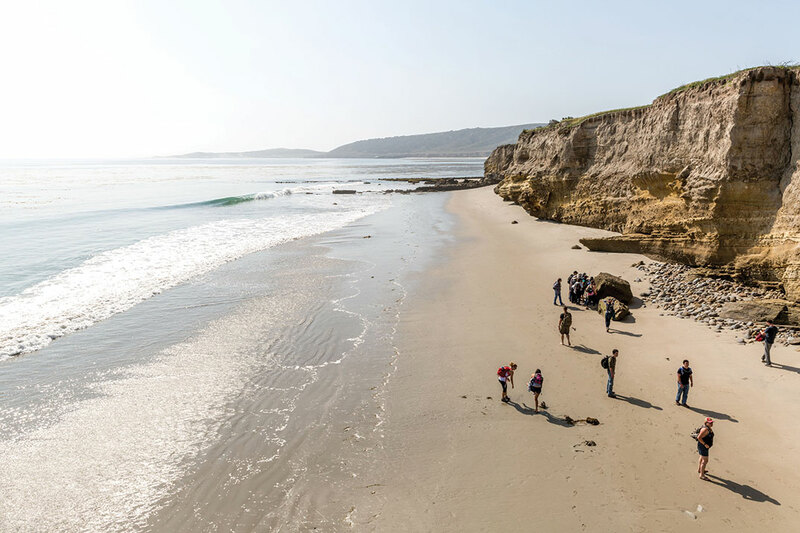 In between all that, Cause would mentor undergraduate researchers, teach classes for our ESRM program (most notably our Summer Field Methods and Channel Islands Natural History Courses), be our chief liaison with the Park Service, and have a vibrant family. This guy was not lacking in the energy and passion department. Yet another sandy beach ecology sampling effort on Santa Rosa Island. If all of this wasn’t enough, next on Cause’s to do list was to begin to deepen connections with distant programs and research stations. He had a plan to morph of our Field Methods summer class into a rotating course which would alternately be taught on the big island of Hawaii (where you will recall he did his PhD work) and on Santa Rosa in a collaboration with the University of Hawaii. We planned to take my Coastal and Marine Management class to Hawaii in October of 2016 in something that would amount to a logistical run through for that future class and be an initial toe in the water for such cross-state collaborations. So too was Cause planning on travelling with us to Costa Rica as part of our occasional interdisciplinary course there over winter break with Dr. Don Rodriguez. It was only about 10 days before that October trip to Hawaii when we first learned of his emerging health problems and what would soon translate into his needing to step back from work to focus on the birth of his second daughter and begin treatment. I have so many memories of Cause. From silly to earnest, wonder to mundane. I could talk about the time he claimed he was an epic bowler or the conversations with the park service over bones in the intertidal or how proud he was over our first-ever exhibit on campus of Santa Rosa Island impressions and experiences, and on and on. But what I would really like is for all of you to share some of your Cause memories or photos or videos in the comment section below. 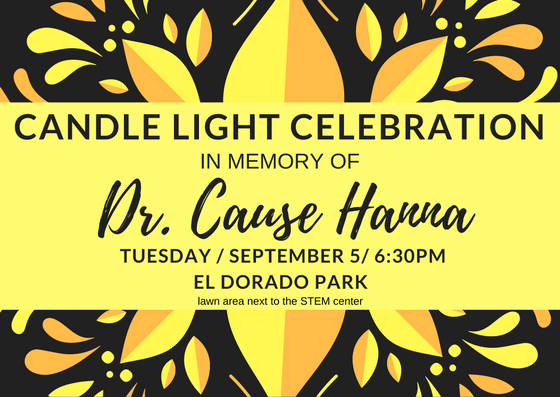 And please consider coming to Tuesday’s memorial for Cause near the big fountain in the Central Mall in the middle of campus at 6:30pm. The best way to keep him alive is to keep those memories alive and to live the lessons and examples he imparted to us all. Update: Please check out the recent profile of Cause from the Ventura County Star on September 3, 2017. Please add your comments and recollections below! This entry was posted in history and tagged Channel Islands, Santa Rosa Islands Research Station, SRI. Bookmark the permalink. Cause was the most gifted field teacher I’ve ever worked with, but it was watching him with family on the island that most moved me. I’m glad I got the chance to tell him then that he’s a role model for me as a father. I had the fortune of performing my senior capstone on Santa Rosa Island. During this time, I not only took part in a once in lifetime research opportunity, but I made some of the best friends I’ll ever have. I like to count Cause among them. He was more than a mentor, more than a research advisor or station manager. He was an inspiration. His attention to detail, humility and quiet intensity are elements that I always admired. He was a great man, a thoughtful teacher and a friend. I hope that I would make him proud. I am stuck on a different island this summer, and for the first time I wish I was on the mainland with all of you. My thoughts are with you on Tuesday. When I met and worked with Cause, we often shared stories about our time in Hawaii. In those conversations, Cause was frank and honest, perfectly describing the challenges of working in a beautiful, but often confounding place. Watching Cause build the program on Santa Rosa, seeing his true spirit, his honesty, and his humor, right there alongside such deep commitment – he set a high bar for us all to aspire to, both personally and professionally. This is such a great loss for family and for friends, for colleagues and for students, past and future. I’m currently in Alaska, so I won’t be able to attend today’s event, but I’ll still be holding up a candle tonight for Cause.